Antoine-Louis Barye (24 September 1796 – 25 June 1875) was a French sculptor most famous for his work as an animalier, a sculptor of animals. Born in Paris, Barye began his career as a goldsmith, like many sculptors of the Romantic Period. He first worked under his father, but around 1810 worked under the sculptor Guillaume-Mertin Biennais, who was a goldsmith to Napoleon. After studying under sculptor Francois-Joseph Bosio in 1816 and painter Baron Antoine-Jean Gros, he was (in 1818) admitted to the École des Beaux Arts. But it was not until 1823, while working for Fauconnier, the goldsmith, that he discovered his true predilection from watching the animals in the Jardin des Plantes, making vigorous studies of them in pencil drawings comparable to those of Delacroix, then modelling them in sculpture on a large or small scale. In 1819, while he was studying at the École des Beaux-Arts, Barye sculpted a medallion named Milo of Crotana Devoured by a Lion, in which the lion bites into Milo’s left thigh. Milo’s theme was the school’s official theme for the medallion competition of 1819, where Bayre earned an honorable mention. Around 1820 Bayre sculpted Hercules with the Erymanthean Boar, depicting Hercules during his third Labor, where he had to capture, live, a wild boar from Mount Erymanthos. Barye sculpted the portrait medallion Young Man in a Beret (1823) in bronze, as well as Portrait of the Founder Richard in 1827, in which only a head and neck are shown. He also sculpted Poised Stag in 1829, a much larger sculpture, which had a height of 48 cm, and was one-third of life size. Barye didn’t only want to be known as a sculptor of small bronzes, he wanted to be known as a sculpteur statuaire (a sculptor of large statues). In 1831 he exhibited much larger statues, Tiger Devouring a Gavial Crocodile which was a plaster sculpture 41 cm high and 103 cm long, and Lion Crushing a Serpent, 138 cm high and 178 cm long, made in bronze. In 1832 had mastered a style of his own in the Lion and Snake. 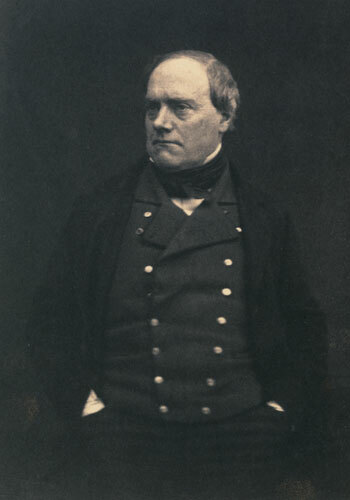 Thenceforward Barye, though engaged in a perpetual struggle with want, exhibited year after year studies of animals—admirable groups which reveal him as inspired by a spirit of true romance, as in his Roger and Angelica on the Hippogriff (1840), drawn from an episode in Orlando furioso, and a feeling for the beauty of the antique, as in Theseus and the Minotaur (1847), “Lapitha and Centaur” (1848), and numerous minor works now very highly valued. Barye was no less successful in sculpture on a small scale, and excelled in representing animals in their most familiar attitudes. Examples of his larger work include the Lion of the Column of July, of which the plaster model was cast in 1839, various lions and tigers in the gardens of the Tuileries, and the four groups–War, Peace, Strength, and Order (1854). In 1852, he cast his bronze Jaguar devouring a Hare. Fame came late in the sculptor’s life. He was made Professor of Drawings at the Museum of Natural History in 1854, and was elected to the Académie des beaux-arts in 1868. No new works were produced by Barye after 1869. While Barye excelled at sculpture he often faced financial burdens due to his lack of business knowledge. In 1848 he was forced to declare bankruptcy and all of his work and molds were sold to a foundry. The foundry began making inferior work from 1848-1857 and his reputation suffered during this time. The mass of admirable work left by Barye entitles him to be regarded as one of the great animal life artists of the French school, and the refiner of a class of art which has attracted such men as Emmanuel Frémiet, Peter, Auguste Cain, and Georges Gardet.